The Oral-B 1000 electric toothbrush is one of the most popular models around the world – and for good reason. If you’re in a hurry, just quickly browse through the answers to these three questions to help decide if the Oral-B 1000 electric toothbrush is right for you. If you have more time, read the full review. 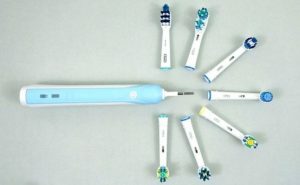 Does the Oral-B 1000 electric toothbrush have any glaring problems or defects? No, it is a very good toothbrush with an overwhelming majority of over seven thousand customer reviews on Amazon’s online marketplace being uniformly positive about its performance. If there’s a drawback to the Oral-B 1000 electric toothbrush, it’s that there’s only one cleaning mode. Other than this, it’s a gem. We’ll look at the pros and cons in the detailed review below. Should I consider other options in the same range? There are a few other models at the price range of this Oral-B 1000 electric toothbrush which may meet your needs, such as the Philips Sonicare ProtectiveClean 4100 and the Oral-B Vitality electric toothbrush. 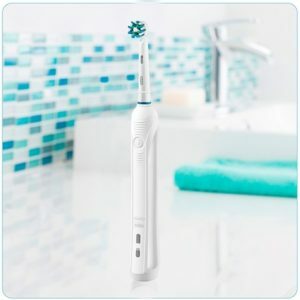 The Sonicare ProtectiveClean 4100 is an equivalent to the Oral-B 1000 electric toothbrush in features and performance, while the Oral-B Vitality is a modestly cheaper alternative to it. Where can you buy the Oral-B Pro 1000 electric toothbrush? You’ll find this hot seller in almost every retail outlet, especially in the US, including chains like Target and Walmart. But there’s a distinct advantage in buying the Oral-B 1000 electric toothbrush online from an e-commerce outlet like Amazon or eBay because from time to time there are special deals and discounts that let you get more for your money. There’s an extra benefit from at least checking out the online stores. You’ll get to see what other buyers like you are saying about this model, which might point out some unique advantages or drawbacks that could influence your decision. If you’d like to take a look at the Oral-B 1000 electric toothbrush on Amazon, here’s a link that’ll take you straight to the product. Why should you trust A Dentist’s Daughter? Our electric toothbrush reviews are always considered from your perspective, as a buyer. Because we’ve been doing this for a long time, and have had the chance to look at a range of different brands and models, our analyses are more detailed and guided by the important elements that we’ve outlined in the Buyers’ Guide for the Best Electric Toothbrush. We aren’t dentists or dental hygienists ourselves. This isn’t medical advice. You should always go by your dentist’s recommendation while making choices about your oral hygiene. So please check with your dentist before making a final choice – especially if you have any dental problems. Okay, with that out of the way, let’s take a deeper dive into the details of the Oral-B 1000 electric toothbrush and look at what makes the Oral B 1000 Pro so popular with buyers in so many countries. What is the Oral-B 1000 electric toothbrush? It’s a relatively simple, no-frills electric toothbrush manufactured in the United States by Braun (which has recently been acquired by P&G, making it a fully owned subsidiary). The Pro 1000 looks good, feels good and cleans good. Its performance statistics are impressive, and you’ll be happy with the cleaning action it delivers. The price is just right, and not too expensive for most budgets. It’s a reliable electric toothbrush that gets the job done effectively, without any fuss or mess. A word of caution: If you have sensitive gums or teeth, the Oral-B 1000 electric toothbrush may not be your best choice. But for everyone else, it’s a good option. The Oral-B 1000 electric toothbrush is a nice, comfortable instrument that feels good in your hand and handles well while brushing your teeth. It has a hand grip made of rubber and plastic, which makes it easy to hold even while wet and slippery. An inbuilt timer indicates when it is time to change to another quadrant, ensuring that you clean all areas adequately. Like most Oral-B electric toothbrush models, the Pro 1000 is programmed for a 2-minute brushing sequence, and indicates every 30 seconds that it is time to shift. Although the Oral-B Pro 1000 electric toothbrush operates in only one cleaning mode (Daily Clean), it delivers an impressive performance by way of plaque removal, clearing away food particles stuck in between teeth and overall whitening of stained or yellow teeth. The downside is that the single operating mode isn’t suitable for those with sensitive gums and teeth, who might feel the vibratory motion too painful and uncomfortable. Even for teeth whitening, the abrasive action may not be to everyone’s liking. It’s simple and easy to operate this electric toothbrush – just switch it on and get going. No adjustments to make. And it cleans your teeth well, just as any good value electric toothbrush should do. In contrast to other brands like Philips Sonicare, the Oral-B Pro 1000 battery is unimpressive. It holds charge for up to 7 days, which makes for a modest 25 minutes of operation – or less. If you’re a frequent traveller, this means you should plan to carry your charging station along. For what technically qualifies as a budget electric toothbrush, you should expect too much. And the box contents are indeed limited. You don’t get a travel case, brush head storage, or anything else than the toothbrush and charger. It’s fair value for the price you pay, with no bells and whistles. The Oral-B Pro 1000 electric toothbrush has a pressure sensor that stops all pulsation movement if it detects you brushing too hard. However, there’s no visible indicator like a colored light and you can’t easily tell if you’re pressing too much. If you’ve already used an electric toothbrush, you no doubt have a view about a device’s looks and design. We think the Oral-B 1000 electric toothbrush is a nicely designed instrument that doesn’t look too clinical, nor too flimsy and weak. You can choose between a black or white toothbrush, depending on which you think looks more attractive. The toothbrush is made of glossy plastic, with a rubber grip running down the length of the handle along the front (which is colored either black or light blue). The handle itself isn’t too thick or thin, making it easy and convenient to grip and hold while brushing. The power button is comfortably situated so that you won’t have much trouble turning it on and off. 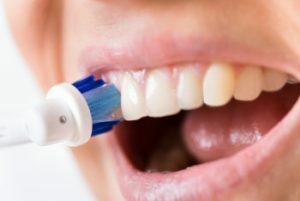 There’s a bit of friction that takes some pressure to turn on the toothbrush, making it unlikely you’ll accidentally turn it on and leave it running to drain the battery. The button is slightly raised and has a white accent, making it easy to recognize. You press it once to turn on, and once again to turn off the Pro 1000. Like all electric toothbrushes, the Oral-B 1000 is heavier than a manual toothbrush. That isn’t surprising when you consider there’s a motor and battery inside the handle. You’ll quickly get used to the slightly higher weight and not even notice a difference after a week or two. One extremely useful feature is the inbuilt timer. Most dentists recommend twice daily brushing for two minutes each time. The Oral B Pro 1000 delivers an audible indication (along with a brief pause in brushing) at 30 second intervals. This reminds you to move on to the next quadrant, ensuring good cleaning of the entire mouth. In case you’re wondering what “next quadrant” means, we divide the mouth into four quadrants – top right, top left, bottom right and bottom left. (Some people refer to the top outer surface of your teeth as one quadrant, with the top inner, bottom outer and bottom inner surfaces being the other three). However you choose to define ‘quadrant‘, if you switch from one to the next every 30 seconds, by the end of a 2-minute cycle you will have cleaned all teeth adequately and well. Well, hardly anyone focuses their entire attention on the act of brushing teeth, or looks at a clock regularly while cleaning. It’s easy to be distracted and focus too long on one area, or too little on another. This influences the cleaning result you’ll get from an electric toothbrush. An inbuilt timer helps you overcome this drawback. It might seem obsessive to keep returning to this, but brushing for two full minutes is vital to your oral hygiene and teeth cleanliness. It’s just as important to brush for long enough as it is to use the right technique. Simply owning an electric toothbrush won’t make your teeth whiter or get rid of cavities if you don’t brush the right way, for the right length of time. A word about the special Cross Action brush head that comes included in the package. 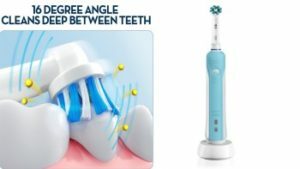 There’s one CrossAction Oral B brush head included in the package, and boasts the latest brush head design that’s effective at giving an all-round clean. The name comes from its design, with hundreds of bristles arranged at angles to each other. They point in different directions, but the seemingly chaotic arrangement actually helps cover all parts of the surface of your teeth, reaching effortlessly into crevices and gaps to clean more efficiently. This could never happen with straight bristles. The rotatory brush head is an important part of the Oral-B 1000 electric toothbrush’s performance capacity, and helps remove 300% more plaque than a regular toothbrush. You’ll notice your teeth feeling clean and fresh after brushing with it. All that’s needed is to have the brush head skim the surface of your teeth. That’s right. You don’t have to exert much pressure to enjoy the cleaning effect. In fact, if you press down too hard, the pressure sensor will kick in and turn off your electric toothbrush. A semi-drawback is that there’s no visible indication of the pressure sensor. Other models like the Oral-B Genius Pro 8000 have visible pressure sensors that glow with a bright red or orange light to warn you that you’re brushing too hard. But the Pro 1000’s internal motor does sense any pressure, and automatically lowers the power until pressure is relieved. How can you tell this is happening? The noise will change in frequency, sounding like it strains hard when you press down. Just lighten up a bit, and it’ll resume a smooth hum. That way you won’t damage your teeth or gums. The Oral-B 1000 electric toothbrush head is removable, and can be pulled off and pushed back on without using much force. The idea is to make it easy to replace your brush head with a new one every three months. Remember to do this regularly, because using older and worn out brush heads will lower the cleaning efficiency, as well as risk gum injury. Some of these brush heads are designed for maximal efficiency with certain modes of cleaning. But all of them can perform well with the DailyClean mode on your Oral-B 1000 electric toothbrush. To learn more about the different Oral b electric toothbrush replacement heads, check out our special report on the topic. Is the Oral-B Pro 1000 water-proof? The Oral-B 1000 electric toothbrush is water resistant. While brushing, the handle and head will no doubt become wet with paste and saliva. It can be easily cleaned by washing under the tap. However, it is not recommended to use an electric toothbrush in the shower or a in a bathtub. Immersing your toothbrush completely in water could damage it badly. After cleaning, it helps if you can wipe the brush to remove any moisture from the handle. This is because the batter and motor that power the brush are located inside the toothbrush handle. And although it is adequately sealed, there might be manufacturing defects or injury related leaks which could let water and moisture seep through to cause damage. When to recharge your Oral-B 1000 Pro? There are two icons on the front of your brush handle. One indicates how much charge is still left on your battery. The other lights up while charging the toothbrush. If the charge indicator flashes red, you don’t have much power left and must recharge it immediately. Typically, a full charge lasts for a week, assuming you brush twice daily for 2 minutes each. How to charge your electric toothbrush? Included in your package is a charging stand. Plug it in. Seat the brush in the charger. Leave it for 8 to 12 hours to charge fully. Check the charger for voltage requirements, just to ensure that you’re not accidentally plugging it into an electric outlet with higher or lower voltage. What’s the best way to clean using an electric toothbrush? Is there a strong warranty? The Oral-B 1000 electric toothbrush comes with a standard 24 month warranty. But as with any electric or electronic device, there are conditions and exclusions that you must be wary about. If the model isn’t available in your country and is being imported into it, the warranty terms might be even more restrictive. So check to make sure. The same goes for finding a good service center in case you need to have your Oral B Pro 1000 repaired or serviced. What’s lacking with the Oral-B 1000 electric toothbrush? For a budget toothbrush, you can’t honestly expect too many frills – and there aren’t any with your Oral-B 1000. There’s no travel case for packing your device to take along on trips. Nor do you get storage compartments for spare brush heads. You’re also limited to a single cleaning mode, in contrast to higher priced premium models that have sensitive and unique modes for special needs. 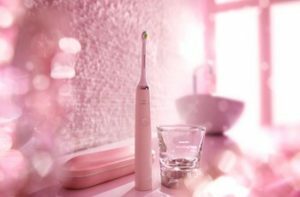 A few of these top-of-the-shelf brushes like the Sonicare DiamondClean toothbrush even have bluetooth connectivity with smartphone apps tracking your brushing activity! None of this is included in your Oral-B 1000 electric toothbrush . And most buyers don’t mind – because what they’re looking for is a brush that can clean well at affordable cost. For children, a better option might be the Oral B kids electric toothbrush. One negative feature of the Oral-B 1000 electric toothbrush is its limited battery life that only lasts for 28 minutes of function, averaging a week for most users. Comparable devices like the Sonicare 2 Series and Philips Sonicare ProtectiveClean 4100 have batteries that deliver two weeks of brushing activity after a full charge – and they cost almost the same. However, this is a drawback only if you travel often and can’t find a suitable way to recharge easily. For regular use at home, the Oral-B Pro 1000 electric toothbrush is still a great option – just as long as you remember to recharge it often, and don’t leave the brush on and running so the battery drains away. Premium models have more sophisticated indicators that tell you how much battery life is left. The Oral-B 1000 Pro just flashes red to let you know it’s time to recharge – though you might still squeeze a cleaning or two from it even at this point! Then again, when you consider longer battery life often comes at the cost of a heavier brush handle which interferes with comfort and ease of use, you might agree it’s a tolerable compromise. Since a full recharge only takes 8 to 12 hours, you could easily leave it charging overnight and enjoy a great brushing experience for a week after. If you share the toothbrush with others, you’ll need to recharge more frequently. In such cases, it might be best to leave the brush connected to the charging dock whenever it isn’t in use, so the battery is always topped up. What will you pay for a Oral-B 1000 electric toothbrush? The Oral-B Pro 1000 is an affordable electric toothbrush, priced at full retail around the $60 mark – but often available at sizable discounts off this rate. On the Amazon marketplace, you’ll often be able to pick it up for around $40 to $45. And even in retail outlets, you’ll often find coupons that bring down the price to this level. At this price point, the Oral-B 1000 electric toothbrush is a fantastic deal! Like any other electric toothbrush, you must factor in the cost of replacement brush heads into the overall price of usage. Typical use will require replacing a brush head every 3 months. Replacement brush heads can be bought in packs of 2, 3, 4, 5 or 10. The price of each head is around $6 to $8 on average, with cheaper rates on larger pack refills. All things considered, the lifetime cost of this model of toothbrush makes it among the most affordable options of all budget electric toothbrushes, with very good performance characteristics for this low price. Will the Oral-B 1000 electric toothbrush last long? Thousands of delighted Oral-B customers will attest to the fact that your toothbrush will stand the test of time and serve you well for at least 3 years, more likely much longer. While the plastic and rubber might show signs of wear and tear over the years, you can reasonably expect the instrument to keep working for a long time. The weakest link is its battery. Constant recharging of a battery naturally leads to it failing eventually. Another possibility is the internal components wearing out with constant use, but again this will probably only happen after many years of use. To safeguard against manufacturing flaws and accidents, the Oral-B 1000 electric toothbrush comes with a two year warranty against mechanical defects, and should give you the confidence to go ahead with your purchase. Extended warranties are usually available from the retailer, so check for them if you’re interested. The Oral-B Pro 1000 electric toothbrush is one of our favorites in this price range, with an excellent cleaning effect and high comfort rating. It looks good, offers a choice of colors, is convenient to use and clean, delivers decent battery life and is great value for your money. What it lacks by way of extra bells and whistles, like a carrying case, storage space for extra brush heads, bluetooth connectivity or multiple cleaning modes, it more than makes up for with superior cleaning performance and lower cost. It’s a good choice of electric toothbrush for anyone, unless you suffer from sensitive gums and teeth. If you’re looking for a model with more features, then you might want to consider the Sonicare DiamondClean or Oral-B Genius Pro 8000 Electric Toothbrush instead. But if all you want is a simple, effective, affordable electric toothbrush that delivers a good cleaning experience and will enhance your oral hygiene, the get this Oral-B 1000 electric toothbrush and impress your dentist at your next visit! Q: Is the Oral-B 1000 Pro electric toothbrush oscillating or sonic? A: It is a rotatory/oscillating toothbrush, which cleans with rotation and pulsation. Q: What does the single cleaning mode mean? A: The Oral-B 1000 electric toothbrush offers one cleaning mode called DailyClean, which is very effective at using the Oral-B 3D cleaning technology to keep your teeth feeling clean, looking white and cavity-free. The instrument will remove plaque upto 300% more effectively than a manual toothbrush. Q: Does it offer multiple cleaning modes? A: No, there’s only one mode for cleaning teeth with the Oral-B 1000 electric toothbrush. If you want a more feature-rich toothbrush, consider the Sonicare DiamondClean or Oral-B Genius Pro 8000 instead. Q: What brush heads can be used with the Oral-B 1000 Pro? A: Your Oral-B 1000 electric toothbrush comes bundled with a CrossAction brush head. There are some options which ship with FlossAction or 3D White brush heads. The brush handle is compatible with different brush heads, which can be attached to the Oral-B Pro 1000. These include the Deep Sweep/TriZone, Cross Action, Sensitive, Floss Action, Precision Clean and Pro White/3D White brush heads. Q: Can brushing activity be monitored on a smartphone app? A: No, the Oral-B 1000 electric toothbrush does not come with Bluetooth functionality, like some other premium models do. Q: Is there an inbuilt timer? A: Yes, the Oral-B 1000 electric toothbrush has a 2-minute timer with Quad-pacer which helps you brush for the recommended two minutes, and ensures that you’ll move between the four quadrants equally to achieve the best results. While the timer does indicate audibly and with a brief pause when 30 seconds are up, you do not get a visible indication such as a red or orange glow as with some other expensive models. Q: Does the Oral-B Pro 1000 come with a warranty? A: Yes, the default warranty is two years when purchased from an authorized dealer, both offline and online. Regional differences exist, so please check up on the validity of the warranty in your country before purchasing. Q: How good is the battery life? A: The Oral-B 1000’s battery lasts around 28 minutes of active brushing. With typical use, this means a charge will hold long enough for a week’s cleaning. Q: Is a charger included? 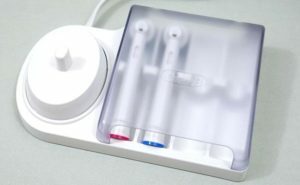 A: Yes, you get a charging station along with the toothbrush. Depending on the country from which you order, the voltage of the station might differ. The charger cannot be wall-mounted and must be placed on a flat surface. Q: Is the Oral-B Pro 1000 waterproof? A: It is water resistant but should not be immersed in water fully. For best results, wipe it clean of extra moisture after use. Hopefully this Oral-B 1000 electric toothbrush review was helpful in making your decision. 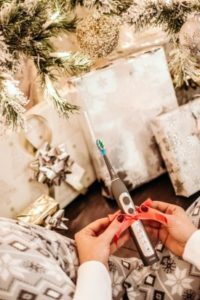 If you already own an Oral-B Pro 1000 or have decided to buy one, please share your thoughts about it here.